Sundance Institute and the President’s Committee on the Arts and the Humanities have announced that FILM FORWARD: Advancing Cultural Dialogue will host free public screenings of eight films for the first time ever in Tacoma. These films are: Town of Runners, the Light in Her Eyes, Chasing Ice, the Loving Story, Bones Brigade, Valley of Saints, Beasts of the Southern Wild, and Under the Same Moon. The film tour will take place Sept. 3 – 7, with moderated discussions following each screening, and filmmakers Julia Meltzer (The Light in Her Eyes) and Jerry Rothwell (Town of Runners) will be present on Sept. 4 and 5. FILM FORWARD is a partnership of Sundance Institute and four U.S. federal cultural agencies: the President’s Committee on the Arts and the Humanities, National Endowment for the Arts, National Endowment for the Humanities, and The Institute of Museum and Library Services. It is a touring program that offers film screenings, workshops and discussions designed to foster dialogue and cross-cultural understanding. Meet Julia Meltzer, director of The Light in Her Eyes, and enjoy the Muslim Journeys Bookshelf and Book Art Exhibit, “Al-Mutanabi Street.” Light refreshments served. Tacoma Runners will meet at the Grand Cinema, complete their run and return for refreshments preceding the screening of Town of Runners. A gang of disenfranchised kids reject mainstream culture, channel their controlled desperation into a loser activity and redefine winning in the process. Mentored by a former world champion skateboarder, the “Bones Brigade” became history’s most influential skateboarding team. Their countercultural impact continues to affect change with bestselling video games and books and millions of kids who embrace skateboarding around the world. Acclaimed environmental photographer James Balog was once a skeptic about climate change. But through his Extreme Ice Survey, he discovers undeniable evidence of our changing planet. Chasing Ice reveals Balog’s hauntingly beautiful, multi-year time-lapse videos of vanishing glaciers across the Arctic, all while delivering fragile hope to our carbon-powered planet. Even across thousands of miles, the special bond between a mother and son can never be broken. It gives hope to Carlitos, a scrappy nine-year-old boy whose mother, Rosario, has gone to America to build a better life for both of them. While Rosario struggles for a brighter future, fate forces Carlitos’ hand and he embarks on an extraordinary journey to find her. Houda al-Habash, a conservative woman preacher in Damascus, Syria, calls girls to the practice of Islam, teaching them that pursuing their ambitions is a way of worshipping God. Shot right before the uprising in Syria erupted, The Light in Her Eyes offers an extraordinary portrait of a leader who challenges the women of her community to live according to Islam, without giving up their dreams. 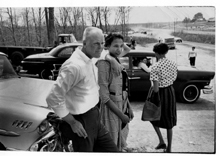 A racially-charged criminal trial and a heart-rending love story converge in this documentary about Mildred and Richard Loving, a part-black, part-Indian woman married to a white man in Jim Crow-era Virginia. Thrown into rat-infested jails and exiled from their hometown for 25 years, the Lovings fought back and changed history. Town of Runners is a feature documentary about young people from the Ethiopian rural town of Bekoji, whose runners have won 10 Olympic Gold medals in the last 20 years. The film tells the story of three teenagers who want to follow in their heroes’ footsteps, as they move from school track to national competition and from childhood to adulthood, trying to run their way to a different life. Using Kashmir’s picturesque Dal Lake as its backdrop and underpinned by the political unrest in the region, this moving drama explores the relationship between two best friends and the female researcher studying environmental degradation who threatens to distract them from their dreams of escape.